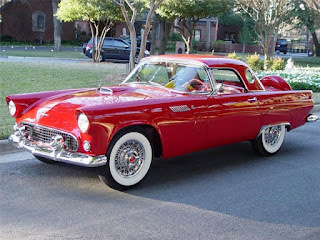 Muscle Car of the Week: ’56 Thunderbird! Today we’re going to be taking a look at a car that’s been a staple in every auto restoration shop for decades – the 1956 Ford Thunderbird! Named after a mythical Native American creature, the Thunderbird (or T-Bird as it came to be nicknamed), was introduced in 1955 as Ford’s very first ‘personal luxury automobile’, putting an emphasis on it’s comfort and convenience options rather than it’s sportiness. It was only offered as a two-door convertible model. The stunning exterior featured circular head beams and stylish tail fins. Not much changed aesthetically for the 1956 version, except that Ford offered optional porthole windows in the fiber glass roof. These were extremely popular among consumers so if you’re thinking about choosing the T-Bird for your auto restoration, you may want to look for that has them installed. This will definitely up your re-sale value. The biggest change for the Thunderbird in 1956 was an optional upgrade in engine size! Ford was now offering a new standard 4-barrel 312 V8 which got 215 horsepower during chassis dyno testing. In addition, you could get even more power if you opted for the Ford-O-Matic transmission. This bumped the horsepower up to 225.